It’s a common recruiting mistake to think that your best candidates will definitely accept your job offer. After all, they’re likely someone else’s best candidate, too. To stay competitive and hire the best people fast, your offer process needs to be as efficient as your recruiting process. 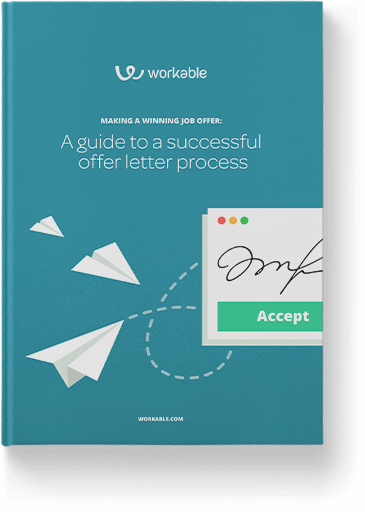 This Workable guide includes resources to help you overcome job offer challenges, with tips on how to write and negotiate better offers and design a better job offer process. Rohma is the Content Marketing Manager at Workable. She's interested in stories about women and diversity in the workplace. She reads and writes with an open mind, and she tweets @rohma_abbas. Nikoletta is a researcher and writer at Workable. She writes about the nuts and bolts of HR and recruiting, with a particular interest in interviews. Find her on Twitter, @Nikoletta_Bika. Christina is a writer and researcher at Workable. She writes about HR trends and reports on the shape of the things to come. She tweets @ChristinaPaulou. Workable is all-in-one recruiting software. A single platform to manage the hiring process, from sourcing and evaluating candidates to making an effective offer. Get all the features free, for 15 days. No credit card required. We all found it really easy to set up; straightforward and transparent. Being able to use it from Day One with no training was a real bonus for us as we desperately needed to start hiring and building our team. Tackle writer’s block with this sample offer letter document that will help you cover all important job-related points. Learn how to personalize your offers with these quick tips on how to make a job offer to a candidate.